Sometime in September my husband, Chris, told me that his Air National Guard Unit was having a “Holiday Ruck and Run” which included a 5k ruck and a 5k run. As soon as he told me, I was all about signing up. I love to run and the added challenge of a ruck made it much more enticing. For those who do not know what a ruck is, it is a military term used for a weighted bag that carries your military equipment that can range from 30-50 pounds. Rucking is when you carry the bag from one location to another. Rucking is the foundation of Special Forces training and requires strength and endurance, both which have been a struggle for me being off medication for 13 months now. Nonetheless, one of my top promises I made to myself was to not let Rheumatoid Arthritis (RA) be in control. EVEN on my hardest days and EVEN when this is easier said than done. I would never turn down an opportunity to wear a costume! to celebrate by going back to Cape May where we got married and retrace the steps from our wedding weekend. We brought up the fact that we need to start training with the rucks and that the “Holiday Ruck and Run” was indeed a holiday theme so we of course needed to dress up. I did not think twice, I love a good costume so I jumped right on board with the idea. We came to the conclusion we were going to be Santa and Rudolph and if we were going to do it right we needed to make a sleigh. Looking back, boy did I fall into that trap. When the week before the run arrived, the run was actually the furthest thing that was on my mind. Chris and I were preparing for the retrieval process of our In Vitro Fertilization (IVF) cycle. Every day brought something new, from shots and pills, to morning monitoring, ultrasounds, and daily calls with the nurse. The Wednesday before the run was retrieval day. We were excited, anxious but overall staying positive. Keeping pictures, tracking and making different letter boards throughout the days was our way to make the process fun and uplifting. Thursday and Friday after the retrieval I was feeling okay as far as post surgery side effects were concerned, but my joints in my hands, feet and shoulders were flaring from my RA and the ruck and run was Saturday. The night before the ruck and run we got our outfits for Santa and Rudolph all ready and had Christmas music blasting to get us in the spirit to make an epic cardboard sled. To help with my flare ups I started a low dose taper of prednisone. Prednisone is a corticosteroid and reacts with the immune system to provide relief to inflamed parts of the body. I am not a fan of taking prednisone due to the long list of side effects, but wanted to ensure that I would be okay for the ruck and run in the morning. I have the best support system! Run with my husband. (Boy was I in for a surprise) We packed the jeep with the sled and we were on our way. As we were pulling into the parking lot I thought I saw a familiar face in the crowd, but brushed it off. However, when I looked again I realized that the crowd that was standing in front of us were all familiar faces. I knew each and every single face that was standing there. They were faces of our friends and family. I was instantly confused. Why were my friends and family at a military ruck and run? When I looked even closer, they all had the same shirts on that read “Sleigh RA with Tray”. Then the pieces all started to fall into place. Check out the awesome pins and medal I received for having the largest team! Me, Chris and Lindsey celebrating after the run! surprise. The idea started with my best friend Lindsey who then spearheaded and organized the team. I was blown away. 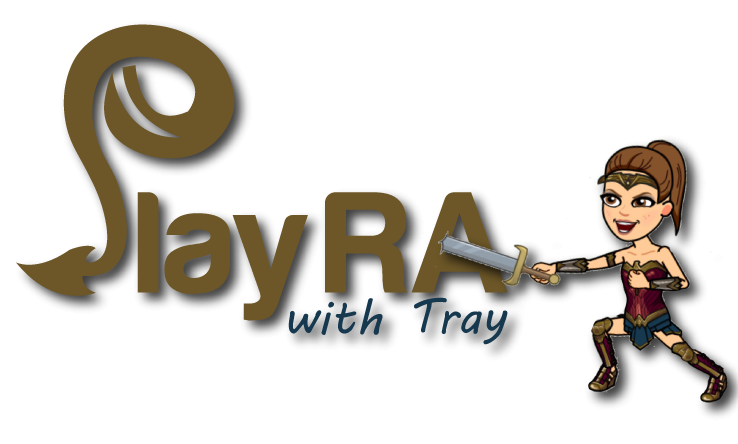 Seeing my friends and family with the same shirts, buttons with my “Slay RA with Tray” logo and purple Santa hats meant more than words can describe. This surprise could not have been more perfect timing with remaining to stay positive during the Fertility treatments and with balancing my RA flares on a day to day basis. The day was filled with laughter, good times and memories I will cherish. My friends and family ran and showed their support that day for a cause I know oh so well. For a cause I only hope one day to see a cure for. Today I did not SLAY RA, but instead my team SLEIGHED RA! My support system is a constant reminder of how blessed I am and a constant reminder to help me continue to “SLEIGH” RA. 2019 Brings a new year. 2018 Becomes the past. You can look at the year in review and think how the past or present was your friend or enemy. The year was your friend during the times you laughed so hard you started to cry. Your friend when you took as many snapchat videos, selfies or pictures so you can rave about. Your friend when you were having quality moments. The year was your enemy when you were experiencing pain. Your enemy when you endured a tragedy or news that deeply saddened you or someone within your support system. Your enemy when times were tough. 2019 is where the strangers lie. The strangers will be new experiences, new endeavors, new hardships, new obstacles, new beginnings, new adventures, etc. Remember you have support systems that will be with you as you navigate the strangers and know that each stranger will soon be a new “friend” or a new “enemy”. Take risks. Believe. Hope. And most importantly remember to SLAY or “Sleigh”!